Rounding the Snæfellsjökull stratovolcano on the edge of Iceland's Snæfellsnes peninsula. 1. It's a cheap way to travel. Some folks travel by bike because they couldn't afford to travel by any other means; some travel by bike because they wouldn't want to travel by any other means. We're probably somewhere in the middle. We definitely love biking, and have a great time of it at home and abroad, but we've also had a wonderful time, say, driving a big roomy truck around Namibia for a month. That big roomy truck, however, cost a small fortune to rent, and consumed lots and lots of pretty expensive gas and pricey insurance to drive, and was easily our largest cost of the trip: more than food and campgrounds and sights combined. Transportation by bike, by contrast, is virtually free, fueled by perhaps just a little more food than your average traveler might need. We think we can afford seeing the world by bicycle (at least for a year or few more); we probably couldn't afford to do it by car or train or bus or plane or boat. Wild camping on a beach outside of Mirleft in southern Morocco. Cost: $0. 2. It's a simple way to travel. No rolling suitcases, no trunk full of things we don't need but have room to bring anyway, no roaring engine to scare away the wildlife or complicated machinery to fix if things go wrong. A bicycle is a very simple object—quiet, light, and efficient—and carrying your worldly possessions on the back of one really helps trim the fat of said worldly possessions. Most things that can go wrong with a bicycle can be fixed with a few hex wrenches and duct tape, and even if the worst happens—a broken derailleur, a cracked frame, a snapped cable—you're still left with a pretty able kick-scooter or pushcart to get you and your belongings to the next town. And because it's so slow (at least relatively speaking), bike travel has a way of keeping itineraries pretty manageable. Traveling by car or bus or train, it's easy to want to see it all, to prioritize quantity over quality and reign far-flung places into a busy, mile-intensive loop. With a bike, you simply can't see it all, and so focus drifts toward appreciating what you can. These two bags carried everything I needed for a month of biking and camping across north Africa's highest mountain ranges. 3. It's a sustainable way to travel. Like it or not—believe it or not—the planet is getting warmer and the climate is getting more unpredictable and a lot of that has to do with us carrying our small little bodies around in big, bulky boxes that weight about two tons apiece. Traveling to beautiful, pristine places behind the wheel of an automobile leaves those places a little less beautiful and pristine than when we arrived, grating up against the leave no trace ethos of the wilderness and degrading the air quality for those in the area. A bicycle isn't just more efficient than a car; it's the most efficient form of propulsion that exists in both the natural and human-made world. A bicycle can carry over ten times its weight, keep on rolling for twenty or thirty or sixty years on just a few tubes of steel, soar downhill with zero effort, and doesn't leave a more than a drop of exhaust, oil, or soot behind in doing so. Jökulsárlón, a glacial lagoon (and one of our favorite stops on our bike ride around Iceland) where the effects of climate change are felt all too immediately. 4. It's a versatile way to travel. Cars (pretty much) need roads and trains (pretty much) need rails and things get a bit difficult when those roads or rails run out. A bicycle, though, is a vehicle that can both carry and be carried: hauled over a fence, pushed under a barrier, thrown onto a rowboat, tossed onto a raft, boxed up into the luggage hold of a plane without too much fuss, fixed to the back of a car, placed gingerly or not-so-gingerly in the bed of a truck, or just heaved up a really, really steep hill. Heck, in absence of a boat (but with a few simple attachments), they can even be pedaled right across water. En route to an abandoned geothermal pool in southern Iceland. When the pushing gets tough, the tough get pushing. 5. It's a gratifying way to travel. I've scootered along some pretty winding roads (pretty windy roads too, for that matter), and driven stick through a canyon without really knowing how to drive stick, and certainly steered a normal sedan along some pretty steep ridges without incident, and all these things have made me feel pretty proud of myself afterward. But that's all dwarfed by the sense of accomplishment a bike traveler feels after summiting a mountain pass (or just a steep hill), clocking in their first hundred-mile day, or looking at a map after a few weeks on the road and thinking wow, I got from this dot to that dot all by myself. 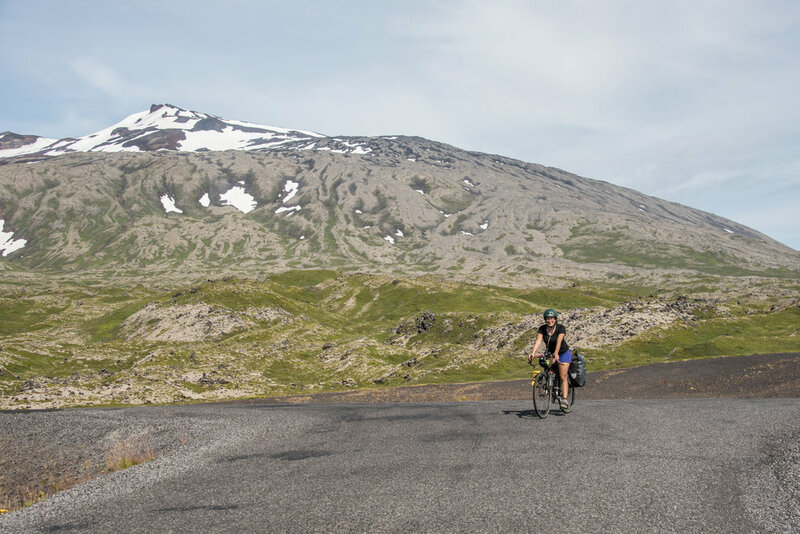 Traveling by bike is self-reliance like no other, and it leaves the rider with not just a wider view of the world, but a wider view of what they're capable of physically, mentally, and often mechanically. Rewarded with a spectacular view (and a thrilling descent) after two difficult days climbing the Atlas Mountains. 6. It's an intimate way to travel. Traveling at speed, it's easy to miss a whole lot of the mini-treasures the world has to offer. One can get on the highway on one end of America and drive to the other without really smelling anything but air freshener and fast food joints, and without really seeing anything but road signs as big as houses and those same fast food joints, and that's definitely a time-efficient way to travel but not really an intimate way to travel. By bike, there's time to spot the snakes and millipedes slithering along the road, to smell the tajine stewing in that little shack, to spot the sheep way up on that precipice to the left. And plenty of time to say hello to people and talk to people and leave those people with a smile, not just a cloud of dust. Making friends on the side of the road. 7. It's a vulnerable way to travel. Intimacy and vulnerability go hand-in-hand. When traveling by bike, you're vulnerable to everything: to the drivers speeding by you, to the locals milling about ahead of you, to the potholes in the road and the clouds in the sky and the sun and the wind and the heat and the cold and the fog, and vulnerable to your tendons and joints and the tendons and joints of your bike, too: a chain waiting to snap, a spoke waiting to break, a tube waiting to split, a frame waiting to crack in half. Cars don't offer complete control, but they do offer the illusion of complete control. They offer protection from all the above: airbags for other drivers, door locks for locals deemed suspicious through a windshield at fifty miles per hour, spare tires in the trunk for the unlikely flat, a solid chassis for the rain and the sun and the wind, heat and air-conditioning for weather that isn't in the perfectly desirable range of 68 to 72 degrees Fahrenheit, fog lights and high beams for heightened visibility, and above all else, a powerful and pricey motor to whisk you away to safety if anything goes wrong. Cars create the expectation that disaster can be averted: just trust the car. Bikes create the expectation that disaster is pretty much inevitable and should be embraced: just trust the universe and the people that inhabit it. And with that vulnerability comes immense generosity: good folks who will recognize your helplessness and recognize that you need assistance in one form or another and offer it in spades. Sharp, winding roads across tough, dry terrain en route to Morocco's Tizi n'Test. 8. It's an adventurous way to travel. In a world of prepackaged tours to North Korea and comfy coaches through India and bundled safaris with detailed itineraries and prebooked lodging, it's fully possible—common, even—to leave one's home and get on a plane and travel for a weekend or a week or two weeks and come back home and have everything work out just about as planned: the hotel rooms were just as they appeared in the photos, the restaurant reservations were every bit as good as Yelp had promised, the Lonely Planet guide got the admission price to the museum a little wrong but was still correct about the museum hours. And this is all totally fine and grand for those reluctant to travel, or those seeking some routine and predictability when doing so, but for the more intrepid adventurers out there, it can all feel a little well-worn. Even between two set points, no two bike trips are the same. The first might be characterized by strong headwinds and rainy skies and frigid temperatures and lots of traffic and a flat tire ten kilometers in, and the second might be enjoyed under warm sun and a gentle breeze and an unexpected detour because a friendly local was kind enough to invite you to tea in their home. On a bike, twenty kilometers might take an hour or it might take a day, and the sheer multitude of factors that might influence that dwarfs any common form of travel by a whole lot. Wild camping on the Icelandic coast after a windy, rainy day of travel. AN IMPORTANT CAVEAT, THOUGH: IT'S SOMETIMES A PRETTY MISERABLE way to travel, AND TOTALLY NOT FOR EVERYONE, AND THAT'S OKAY TOO. This should go without saying, but of course there's nothing wrong with traveling under different values, and maybe not really seeking a trip that's particularly cheap, simple, sustainable, versatile, gratifying, intimate, vulnerable, or adventurous—or maybe is some of those things but not others, or maybe is none of those things but some other pretty important things. Because in addition to being slow and intentional and sometimes enjoyable, bike travel is also, more often than you might hope, a miserable way to travel. It takes more time to bike uphill than it does downhill, and most bike journeys probably start and end around the same elevation, meaning that any bike traveler is probably going to spend more of their time (at least two or three or four times more) biking uphill than rolling downhill, and they're probably (if they're anything like me) about two or three or four or a hundred times more miserable in doing the former than the latter. Chances are it'll be windy, and bike travelers never feel tailwinds (they just assume they're particularly strong that day), but they do feel headwinds (and they're pretty miserable, too), and so, when biking around the world, it's likely you're going to spend more time begrudging the wind in your face than appreciating the wind silently nudging you along. Chances are a vacation of biking and camping and not showering and sucking in exhaust and burning off successive layers of skin in the open sun isn't going to be totally pleasant—or what most folks would deem a vacation—and so there's nothing wrong with being the type of person who doesn't like to take time off and travel somewhere with the predetermined expectation of being miserable. A particularly awful stretch of gravelly, wet, uphill cycling en route to Thingvellir, Iceland. For those who do, though, the hope (and the reality) is that the roller coaster has more ups than downs, higher peaks than those shallow valleys, and that the misery makes it worth it—indeed, some might say the misery is a vital part of appreciating it at all—when the joy comes around in its myriad forms: the lifelong memories that seem to cost nothing, the countless days worrying of nothing but a little food and some grass to sleep on, the clean air of engine-free travel, the shortcut won on the back of a pick-up or the tubes of a subway system, the hard-earned privilege to stand atop a mountain pass you've arrived at all on your own, the many personal connections and conversations with slow-moving passerby, the gracious help provided by those same people, and the realization of a journey unlike any other. Simple living: cycling and camping on the shores of southern Morocco. If you're a bike traveler, what motivates you travel by such slow, primitive means? Let us know in the comments section below!